The first pre-requisite in prayer is that a person should seek and know God's will about the issue at hand. To ask God to do things that are assuredly not this will is to wage war, through prayer against God and against oneself. To pray that God will put aside this will and do something else, is to attempt to murder God. To pray that God would act according to the desires of one's heart instead of acting according to His pre-determined purpose is to attempt to overthrow Him; it is also to do one's spirit, soul and body untold harm. Those who have begun to know God will prefer to spend ten hours praying for a revelation of God's will, than to invest ten thousand hours praying about something in which God's will is not known. Those who have made spiritual progress in the knowledge of God knows that prayer is as dangerous and harmful as it is a blessing. They know that those who pray prayers that are contrary to God's will, are inviting great disaster for themselves, and it will come. Those who know God's will dare not stop praying until they have seen it pass into fulfilment. God's co-workers execute His will primarily through prayer. One man who walks in purity and holiness and prays for three hours each day, does far more good to the kingdom of God than thousands of prayerless preachers who preach many sermons to thousands of people each day. The man who prays five hours each day and reads the Bible for two hours a day then preaches, counsels, or writes for one hour a day is truly doing "full" time work as a servant of God, whereas the person who preaches for seven hours a day, reads the Bible for thirty minutes and prays for thirty minutes, is a spiritual spy. At the judgment seat of Christ, the greatest crowns will be won by those who soaked their ministry in prayer. Such are now putting more time into praying every activity through, than the time that the activity actually takes. They have learnt that what is not done through prayer is not done at all. To pray effectively we must want what God wants - that and only that is to pray in the will of God (A.W. Tozer). Only long, continued, faith-filled travailing prayer can bring true revival to the church. Only long, continued, faith-filled travailing prayer can bring true revival to an individual heart. "I appeal to you, brethren, by our Lord Jesus Christ and by the love of the Spirit, to strive together with me in your prayers to God on my behalf, that I may be delivered from the unbelievers in Judea, and that my service for Jerusalem may be acceptable to the saints" (Romans 15:30-31). 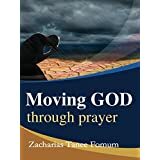 "You also must help us by prayer, so that many will give thanks on our behalf for the blessing granted us in answer to many prayers" (2 Corinthians 1:11). "Do you not know that in a race all the runners compete, but only one receives the prize? So run that you may obtain it. Every athlete exercises self-control in all things" (1 Corinthians 9:24-25). Everyone who wants to make progress in the School of Prayer must exercise self-control in everything - sleep, the use of time, the use of his mind, the use of his mouth, and so on. Without such discipline he will know only limited power in prayer because, careless thoughts and careless words result in spiritual leak. "When Daniel knew that the document had been signed, he went to his house where he had windows in his upper chamber open toward Jerusalem; and he got down upon his knees three times a day and prayed and gave thanks before his God, as he had done previously" (Daniel 6:10). 19. "But seek the welfare of the city where I have sent you into exile, and pray to the Lord on its behalf, for in its welfare you will find your welfare" (Jeremiah 29:7). "There is none that calls upon thy name, that bestirs himself to take hold of thee..." (Isaiah 64:7). The Church would be better prepared for her Lord, and prepared the sooner, if all her leaders took one year off preaching and gave it entirely to seeking, through prayer and daily waiting on God, that holiness without which no man shall see God . All revival that is not rooted in heart-searching and heart-rending prayer to the Lord is at best human emotionalism. The wisest people are students in the School of Prayer. The Lord has called the wise to pray. Only fools do not obey. Today is the day of prayer. This year I will devote the first week-end of every month to prayer. This year convert every public holiday into a praying day, spend twelve hours that day in prayer, and you will soon see a difference in your life.